Sometimes God surprises me with things that don’t seem much like gifts at the time. Can I be honest with you? The reason I sat on my One Word for 2016 post for five days before I hit “publish” was this: I wasn’t super psyched about the word God had given me. I wanted something passive. Something that wouldn’t require much from me other than just showing up and being myself. …Something like the word He gave me in 2011: “Rest.” Or like the one He gave me three years ago: “Enjoy.” Even last year’s word “Follow” was good for me— it implied responsibility on my part, but ultimately the real work was being done by the One I was following. He was leading me and my job was “merely” to stay in tune with Him and follow His lead. After all, isn’t “Following” what being a disciple of Jesus is really all about? 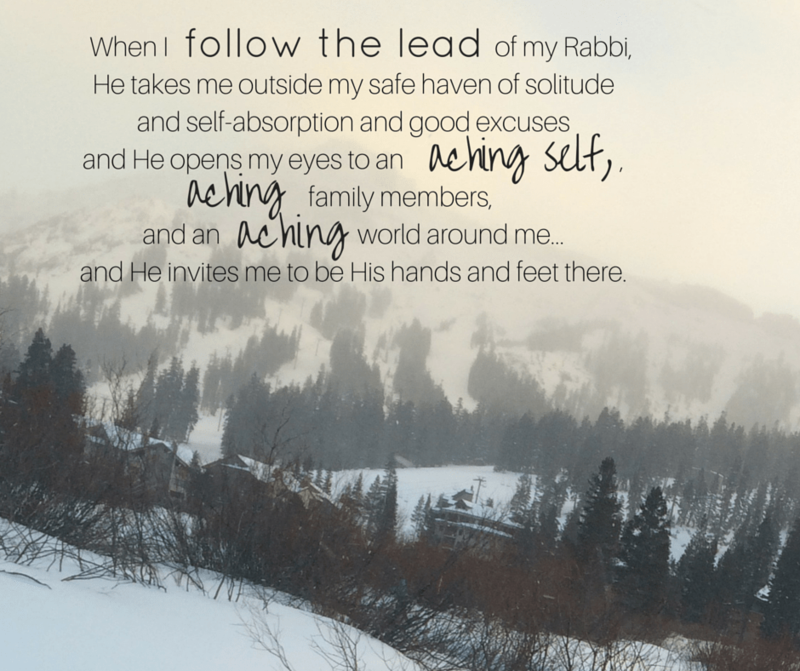 Walking in the dust of our Rabbi, our Teacher, the One with all the wisdom and insight and answers? Or maybe He could have commissioned me to “Abide” all year? Or “Dwell”? Or “Chill”? But that’s not really what real life is like, is it? When I think about it, I realize this: Last year— my glorious year of “Follow”— was actually one of the hardest I’ve had in quite some time. Don’t get me wrong: it was beautiful and rewarding and insightful and incredible in many many ways… but it was dang hard. Any growth I’ve experienced, any maturity I gained, any victories I enjoyed, any improvements in my marriage or in my parenting or in my relationships with my extended family members was hard won. I can’t think of a single meaningful growth-moment that occurred this past year that came without effort, hard work, and maybe even uncomfortable conflict. That’s what happened when I followed the lead of my Rabbi. He took me to challenging self-discoveries. To grueling conversations. To decisions that required high doses of God-infused courage. He took me outside my safe haven of solitude and self-absorption and good excuses and He opened my eyes to an aching self, aching family members, and an aching world around me. A self, family and world that needed me to step up and be my true self here. To be His hands and feet here. A world that needed me to find out who I really am so that I can fulfill my God-given purpose in this broken world. I think the word God chose for me for this year was quite possibly right on after all. Keep refusing to strive in your own strength. Keep enjoying the life and the relationships I’ve given you. Keep tuning into Me and My Truth and My Grace. Keep learning and growing and tackling challenging situations and relationships head on. Don’t shrink back from conflict like you used to. Don’t give up on yourself when you fail or falter. Don’t give up when your relationships get overwhelmingly challenging for you. Even though at times it is discouraging or challenging or exhausting, my Leader is reminding me to persevere. And keep up the good work. What is your “One Word” for 2016? When has God ever told you something or given you something that you didn’t want… but perhaps it turned out to be okay in the end? Please feel free to share your comments or your own journey in the comment section below. Thank you for your encouragement! I pray you will continue to heed God’s call on you to write out your heart– it’s the best free therapy I’ve found! Bless you! I totally identify with your feelings about your word. This is the first year I’m focusing on a word and the word God has given me is “Surrender” which just scared me at first. I am already beginning to like it more though and starting to understand more what the word actually means. It will be interesting to see how things work out over the year. I’m glad to know I’m not alone in my wrestling, Carly. I pray God will strengthen and lead you as you surrender this year. Bless you, friend. How did we not talk about your word yesterday?! Gah. I’d be happy if my word were “ice cream” or “sweatshirt” or “no laundry”…. I’ll pray about it. Glad you’re living the realness of life. ?? I’m visiting from Bonnie’s link-up and I was intrigued by your struggle! Sometimes I feel as if I’m choosing a word to predict my year, not reflect on so I could relate to your reluctance with persevere! But I love the different take of carrying on with the good work you’re already doing. I decided not to choose a word for the year but I’ll reconsider! Enjoyed my visit here! I’m so glad you stopped by for a visit! ? Thank you for your affirmation and encouragement! There are probably some people who could benefit from “chill” being their word of the year, but like you, I think it would be too passive on my part. Here I am Lord, just sitting on my patio, chillin’ like you told me to…. I’m still trying to determine my word, but like your word, persevere, I want my word to encourage me to keep up the good work as well as challenge me to continue growing 2016. Thanks for sharing your word with us!